The only non-piston combustion engine on the market happens to offer tremendous power potential and high specific output, putting the turbocharged Mazda 13B-REW high on the list of petrolhead favourites. Mazda is the only manufacturer to invest and put into mass production rotary engines for passenger cars, and the turbocharged 13B-REW earned recognition for propelling the Mazda RX7 FD3S. The lightweight, low profile rotary engine design allows the engine to sit low and behind the front wheels, helping to lower the centre of gravity. This was one of the great features of the rotary engine that aided in the handling prowess that the RX7 had come to be known for. There were 15 variants of rotary engines that preceded the 13B-REW. However, what set this engine apart was it’s the twin sequential turbochargers, high engine speeds and power output. The rotary’s high exhaust energy can drive massive turbochargers that help to raise performance even further. Its modular design makes increasing displacement possible by adding rotors and housings and employing a new eccentric shaft (the rotary equivalent of a crankshaft.) Despite its high output-per-liter, it is not without its shortcomings. The apex seals (likened to piston rings) are sensitive to detonation, it is fuel inefficient and spark plug life is dramatically shorter compared to piston engines. Nevertheless, rotaries continue to shine in motorsports, powering drag, drift and circuit cars around the globe. The 13B-REW powered professional drag racers like Abel Ibarra and Adam Saruwatari into Import Drag Racing’s spotlight in the 90s while D1GP drivers Youichi Imamura, Ryuji Miki and Masao Suenaga drifted the rotary platform into the 2000s. In SuperGT competition, RE Amemiya and its various sponsors campaigned rotary-powered RX7s up through the 2010 season. The SR20 DET has become synonymous with power thanks to the widespread adoption of the 180SX and 200SX as drift, track and drag weapons. Basically, if it’s been modified as part of the Fast and Furious franchise, then there’s a safe bet the engine is something a little special. Some say, although we’re on the fence with this one, that it’s the greatest four cylinder engine ever produced, but we’re going to be like Switzerland on that one and remain neutral. The SR20 DET came in a variety of 180, Bluebird, Silvia, Pulsar and Sunny models and ranged in power from 201hp upto 247hp. Thanks to the later use of the famous Garrett GT28 turbo (affectionately referred to as the Disco Potato) the 86 x 86mm bore and stroke and 1998cc could be tuned to well over 400hp with relative ease. It’s not unusual to see 600+hp race variants doing the rounds at close to 2.5bar of boost with massively uprated internals, injectors and turbochargers. With a compression ratio of around 8.5:1 the standard bottom ends could easily deal with a solid bar (14PSI) straight from the factory and as a result it unsual to find stock engines in any of the remaining 200sx out there. They might be one of the cheapest and easiest ways to go drifting ever, hence the fearsome reputation of the SR20 in all manner of engine transplants as well. 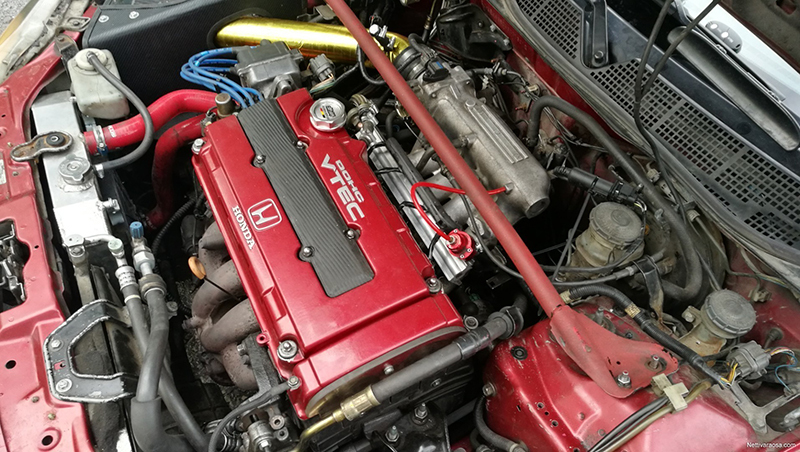 Legendary Honda performance in the shape of the EK and EG Civic 1.6 litre engine that was amongst the first production car engine to crack 100hp per litre. 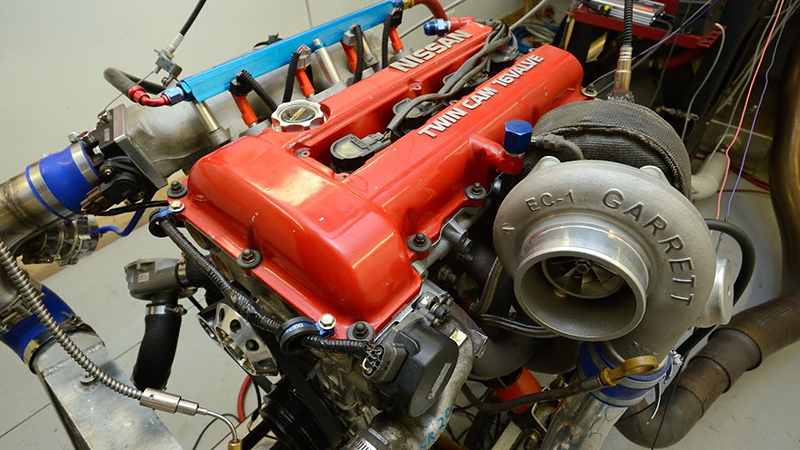 The VTEC technology that polorises opinion immensely was first found in this engine and power outputs varied hugely from 150 to 185hp across B16a and B16B powerplants. The B16B can be identified by the red cam cover. It was introduced in 1989, and the first car with this engine was the Honda Integra. The B16 cylinder block was made of aluminum, and its block deck height was 203.25mm. Inside the unit, they installed a 77.4 mm stroke crankshaft with 81 mm pistons and 30 mm compression height. The engine block is covered with the famous DOHC VTEC head. 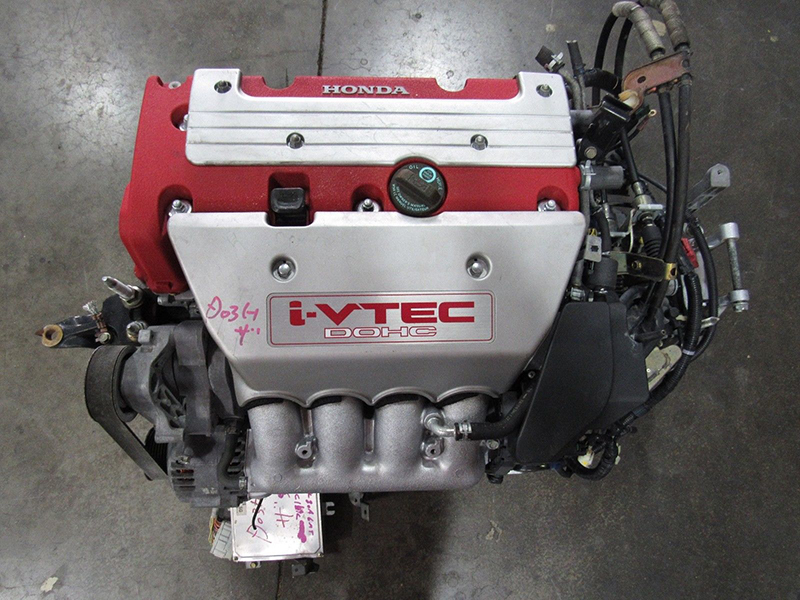 This was the first Honda engine with the VTEC system. The diameter of intake valve was 33 mm, exhaust valves – 28 mm, valve stem diameter was 5.5 mm. The firing order for B16A and B16B was 1-3-4-2. Honda B16 engine belongs to the Honda B series engines, which also includes B17, B18 and B20 engines. Production of the latterly introduced B16B continued until 2000, and during this time, engineers managed to make numerous revisions with block and head. In 2000, both B16A and B16B were replaced by with arguably even better K20A engine in the EP3 Civic Type R. B16B power eventually reached 185hp at 8200rpm in the EK9 Civic Jordan edition. Do you want to drive like a lunatic everywhere? Yet still be able to poddle about town like a pensioner? Then you need a EP3 Civic Type R. Stop looking at every other hot hatch and just get one of these today. It will change your life. The K20a engine is nothing short of incredible. It’s gone on to power so many amazing kit cars, dragsters, hillclimb and trackday vehicles that so legendary and so recognised by the aftermarket, that you’d be a fool to consider any other four cylinder, 16v unit if you want the perfect blend of hooligan and sensible in the same engine. As you reach the 4500 – 5000rpm VTEC zone all hell breaks loose and you really can’t stop smiling. The K20a weighed 184kg, put out anywhere from 197hp upwards (more in JDM market vehicles) and has a bore and stroke of 86 x 86mm. It’s so good this engine that even the heavily revised K20C1 in the latest Honda (FK8) Type R is still based on the same architecture as this 2001 engine. Featuring Balancer shafts, a more rigid crankshaft, high compression pistons (11.5:1), reinforced connecting rods are installed into the cylinder block, and dual valve springs, dynamic camshafts, a lightened flywheel, a PRC intake manifold (an RBC intake manifold for Euro R), an improved header 4-2-1 and a 54 mm exhaust system are used. The size of standard fuel injectors is 310 cc. The JDM K20A camshafts were wilder than Europe market releases: intake 244 and the head porting is said to be as close to perfect as possible for a factory engine. The size of the throttle body was 62 mm, but it’s not unusual to find them running anything upto 70mm individual throttle bodies at upto 10,500rpm for full blown, N/A race applications that make 500bhp with 2.7-litre of displacement based around the later K24 (Accord) bottom end with a K20 cylinder head. Nevertheless with a mash up of K24 and K20 engine parts it’s easily possible to make 300hp naturally aspired with a Frankenstein engine, more than enough to have really good fun on any B-road or racetrack. If you’ve never driven a VTEC engine before, put it on your bucket list now. The VR is a series of twin-turbo DOHC V6 automobile engines with displacements varying from 3.0 to 3.8 L (2,997 to 3,799 cc). An evolution of the widely successful VQ series, it also draws on developments from the VRH, JGTC and Nissan R390 GT1 Le Mans racing engines. A true legend in its relatively recent lifetime. 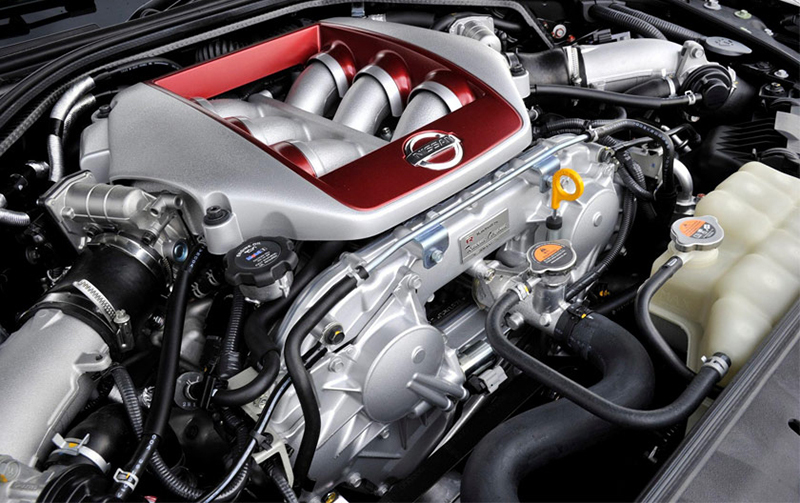 The VR38 DETT is an epic Nissan powerplant that powers the current generation of the Skyline. With already extreme, effortless power direct from the factory and a 0-60 mph time that’s achievable in a frankly bonkers 2.5 seconds in the latest Nismo Competition Skyline, this 591bhp and 481lb/ft 3.8-litre twin-turbo powerplant has quickly become the stuff of legend. It features a number of innovative technologies including an aluminium block with arc sprayed mirror coating to the cylinder bores , aluminium cylinder head, lightweight resin intake and lower oil pan, compact twin direct-mount turbos with integrated exhaust manifold and electronic wastegate actuator, twin water-to-air charge coolers, electronically controlled variable displacement oil pump, electronic intake variable valve control (VTC) And hydraulic continuously variable VTC on the exhaust valves. Stock outputs vary from 485 – 600hp, and aftermarket outputs vary from 600 – 1000bhp, making this engine one of the most tuneable powerplants currently on planet earth. A number of aftermarket specialists exist now to make maximum power from this 3799cc behemoth of an engine.